ANTHEM, with the greatest of respect, does not look like a BioWare game. Well, not in the traditional sense, anyway. 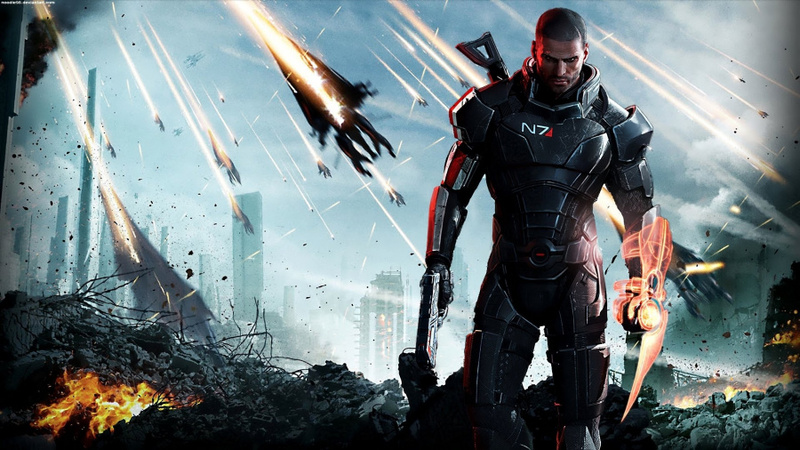 Many fans are wondering what the future holds for Mass Effect, then. Is this the studio’s new direction – or is there a chance it could return to its dialogue-heavy role-playing franchise in the future? General manager Casey Hudson says the door is still very much ajar. So what does BioWare look like right now? “I would say a majority of the people at BioWare are working on ANTHEM, but we do have people who are figuring out what a next Dragon Age would look like.” The company also continues to support its PC-based MMO, Star Wars: The Old Republic. It’s no secret that Mass Effect: Andromeda was a disaster for the developer, but it’s good to know that the door isn’t sealed shut. Unfortunately, with ANTHEM being planned as a service, it’s hard to foresee the sci-fi favourite returning any time soon. Maybe a trilogy remaster could tide us over? We won’t stop asking until EA listens. I just hope by that time bioware is still around to make it. For now a collection will do. Bioware stay away from Mass Effect. Just leave it as is, like having 4 kids, the last one will always be a nightmare. Thats why people decide to stop making babies. Casey you should too. Unless EA puts them down if Athem fails. Good. Its literally the only IP I liked from EA. Hopefully they'll start with a trilogy remaster. Looks like everyone needs to poke and prod EA and BioWare to get them to release the Trilogy on the PS4. Preferably as a remaster. As long as it’s nothing more than a remaster of ME2 then great!! "ANTHEM being planned as a service"
Wow I'm saving so much money by finding out games are going to be unsuitable for me months in advance. After Mass Effect: Andromeda and all the practices made by EA and Bioware, it's really difficult to be excited for a new Mass Effect again. Anthem looks dull too, they failed to build the hype during the conference, imo. @themcnoisy Don Corleone had four children, Andromeda is like Fredo Corleone. I'm only interested in the Trilogy being remastered (not ported) to PS4. I love Mass Effect: Andromeda. Then again, iI don’t have anything else to compare it to seeing as how it’s the only Masan Effect game I’ve played. Get some decent writers in if you do so it doesn't sound like the dialogue is written by a bunch of fanfiction millenials. @PS_Nation Fredo was naive and sweet-natured. The other Corleone children were variously sociopathic,narcissistic or brutally violent. I don't see how your analogy holds true at all. @Areus They already have a book coming out later this year that's supposed to be the sequel to Andromeda. Or at least, that's what I remember hearing. Hopefully it's actually just a side-story so they can have a direct sequel (the book DID get delayed by a few months just recently). @PS_Nation Sonny was a hot tempered and irrational psychopath.Michael was a cold blooded sociopath who killed his own brother. In no way totally awesome. Let's not get into an argument about the relative merits of Godfather characters. @Xaessya Came in to say this, but you ninja'd me. One of those lessons that no one learns in time, and once they do, it's useless knowledge that will never come in handy. Fredo, though, Fredo was a love seeking recognition. Almost cost the lives of everyone in the family. He had it coming. @ToddlerNaruto I would be preordering ME for PS4 in whichever shape or form it appears. Idealy, I would like to see the ME2 mechanics (battles, rpg elements, equipment) implemented in all 3 games in a remaster. @Neolit There is the argument to be made that Fredo was the "good" or "innocent" one of the three sons,making his death at the hands of Michael's hitman all the more tragic. I'm not an expert but part of my college dissertation was a comparison of Godfather characters to Shakesperean archetypes,specifically in King Lear. I'd love to discuss it further but this is a video game website so it's probably not appropriate. Why hasn't Star Wars: The Old Republic come to consoles yet? There's quite a few MMO's on them now. Just release the trilogy on PS4 and then stop making games. @LaNooch1978 you are right, probably not appropriate. In the meantime, let's meet in the middle and agree that Fredo was not good/innocent and he had it coming. I hope it was obvious that I was channeling Deadpool in that one. @Neolit I've never played the series before, I assume ME2 was the best ME game? @ToddlerNaruto regarding systems in the game, yes, I think ME2 managed to strike the right balance between ME1's chore like gameplay and ME3's totally stripped down one. @ToddlerNaruto Story wise, it's a matter of taste, but also in that segment I had the best time in ME2 and its DLCs. As someone playing Andromeda now, I'd like to see the story continued. Also, as someone that never played ME 1-3, I'd certainly welcome a remaster on PS4. I'm enjoying Andromeda and don't get the hate, so I'm hoping that means the first trilogy was REALLY good. @Neolit Thanks for the explanation! Here's hoping we get that PS4 Trilogy remaster. @ApostateMage the irony is that ME2 had brilliant writing.